A regional daily ran a special edition as its patch honoured American airmen who died on its patch 75 years ago. 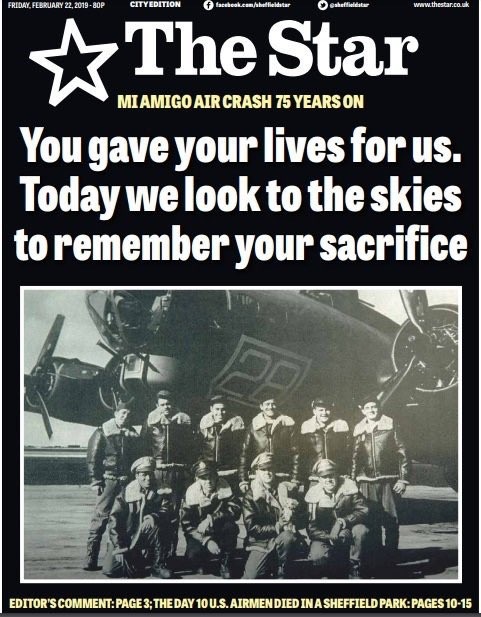 The Star, Sheffield, marked three-quarters of a century since the Mi Amigo air crash, which claimed the lives of 10 men whose USAAF B-17 Flying Fortress came down in the city’s Endcliffe Park after it was badly damaged following a bombing mission over Denmark. A campaign for a flypast to mark the anniversary started after a chance meeting between BBC presenter Dan Walker and Tony Foulds, who witnessed the crash as an eight-year-old boy and now tends a memorial in the park. Thousands of people cheered the flypast, involving military aircraft from Britain and the United States, honouring those who died. The Star’s JPIMedia sister daily the Post has now called for Mr Foulds to be honoured for his dedication to the memorial’s upkeep. An editorial states: “For decades, he has devoted his life to tending to the Mi Amigo memorial after witnessing the tragedy. The “sense of guilt” that he survived, and 10 young men did not return home, remains profound. “What was also so striking was how relatives of the fallen had no idea about ‘their extended Sheffield family’ until relatively recently and how this humbling humanity had brought them great comfort. “And while Mr Foulds, 82, was typically modest when he stressed that the occasion was ‘all about my lads’, the Yorkshire Post and, no doubt, many others, begs to disagree. It’s a fine-looking front page – but how on earth did The Star miss the Tony Foulds tale right under their noses . . . for 75 years? Tony’s tireless devotion was winkled out by BBC presenter Dan Walker while taking his dog for a walk on his day off and stopping to ask why he was tending the memorial to the American air crew. What a scoop! There is a moral to this uplifting – but embarrassing -affair: reporters should get out of the office and start speaking to people again. Then, papers might starting leading and not following. Get out of the newsroom? Heaven Forbid. Did you not know that reporters these days are only allowed to sit glued to their computers a) because there are so few of them thanks to management, b) certain edits]ors (and I worked for one) do not like the thought the reporter might then put in an expense claim. And they (the bosses) wonder why circuclations are declining – because the readers can’t find original stories. Not the reporters’ fault.